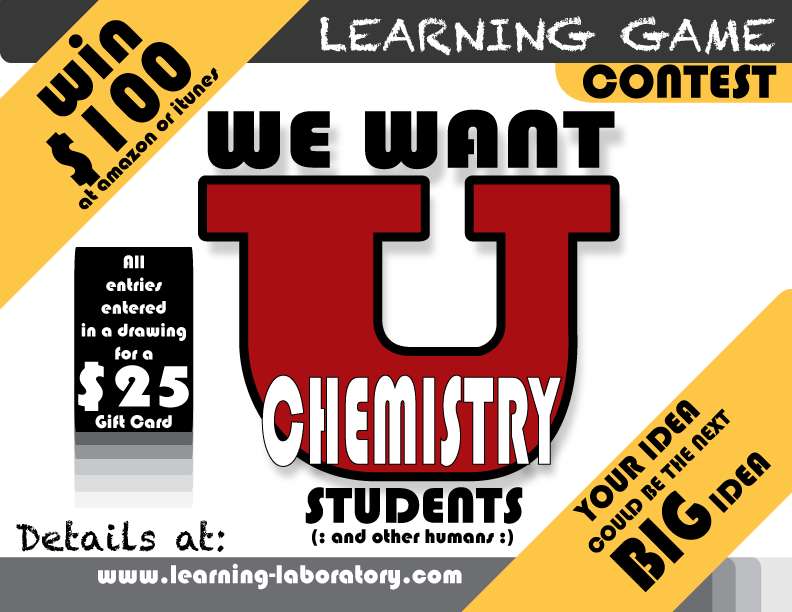 We have two days left until the end of the ‘game idea’ contest we have been running over on Learning-Laboratory.com. I’ve always figured that we would get the bulk of our entries, if any, in the last two days so I’m eager to see what rolls in by Friday. For now, let me just say that, if you know a chem student with even half an idea for a game, you should tell him or her that the odds of any valid entry winning something are, well, quite good. But why run a contest in the first place? We’re in this business to make money not to give it away. So what, specifically, was the contest intended to accomplish? And how do we know, when we are done, if the project has been a success? What are we trying accomplish? Does the idea of ‘learning games’ resonate with students? If we get a reasonable number of entries, we will have some evidence that students dissatisfied with their current drill/study methods and think that online games and activities would be a nice alternative. Does it resonate with instructors? 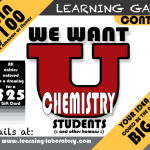 We’ve asked instructors to pin up our poster and/or post a link to the game for students to follow. The contest is intended to help us build our mailing lists and, again, there are two of these: instructors and students. Search Engine Optimization (SEO). The white hat approach to SEO is to build great content and then seek legitimate links. Ashley and Bret have been generating that great content for the last 6+ months; the contest is a way to generate more links. Give me some talking points as I do phone and face-to-face interviews. The contest experience, any entries we get, the sample entry we produced, and our simple implementation of it (Sig Fig Rules!) combine to give me a basis for doing face-to-face and phone interviews with instructors as we go forward. Build our internal WordPress, Google Analytics, SEO, and other marketing skills. Nothing makes one a more effective writer, poster, analyst, strategist than doing each of those things, observing the results, and thinking about how to do them better next time. I’ll report on how well this all actually worked after the contest, judging, and awarding are over.